I would have liked more information on breastfeeding, I didn’t know where to go to look for it! I would like to have known to ask for pain relief in my birth plan! I wish I hadn’t felt obliged to buy every baby product out there, we’ve just had to move him out of the moses basket and he’s only 2 weeks old. The house is over run with baby stuff that I don’t think we’ll ever use. I would like to know how to make sure there is an even balance between me and my partner so I don’t feel like I’m depriving him of the chance to be a Daddy so early on and also so I can try to keep a little bit of me. @Sam R, I really didn’t know what to expect despite a really good NCT session. In a way I was lucky that I ended up with a c-section as they got me sorted in hospital with creams etc. I would loved to have known what my baby would look like. how to cope with feeling down when you havent had much sleep! I wish I’d known more about establishing a feeding routine. i would have liked to have known how to swaddle my baby properly to comfort and relax him. I wish I knew how important it is to burp babies! I wish I’d known that its Ok to let them cry ..you don’t need to panic every time they do it!! I would have like to be told before hand that its okay to feel like your not coping and it isn’t as perfect and straight forward as others make out. And that it does get better and before you know it you know exactly what your baby wants and needs. @Kayleigh, Yes. I think you tend to only see the good bits until you have kids of your own and people put on a brave face. And then when you have your own and tell you the truth, you think they’re just trying to make you feel better! @Joanna Smith, A lot of people swear by cranial osteopathy. Would have liked to have tried it. I’d like to know when my bump will appear? 18 weeks and still no sign! @Lynne Donnelly, Lol. Mine was obvious at 6 weeks! Not sure which is worse! It’ll be unmissable before you know it. I wish i had known more about what the body should and shouldnt be doing during pregnancy. I was a little clueless about what was normal and what wasnt-despite my searches on the internet! I would have liked to have known more about reflux and how to get help with it as my little one really suffered as did I for the first 6 months. I feel like I missed that bonding time with my little one due to the stress of sickness and an unsettled little one. I would’ve liked to have known what was normal and what wasn’t in regards to feeding and sleeping. @claire woods, I agree – there’s such a wide range of normal. I would like to have known a little more about sleep deprivation. I wish I had known more about different slings, and that I had got around to buying a comfy wrap sling for my unputdownable baby. I know the feeling. I didn’t get a decent sling til small one was nearly 6 months, and despite my bad back, it was life changing! 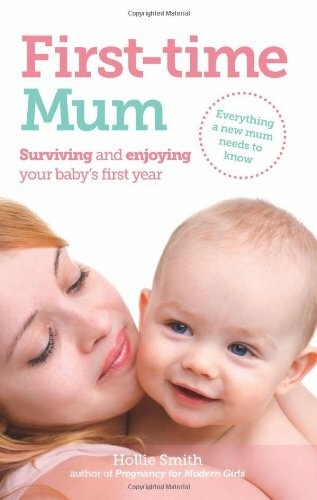 Win a copy of First Time Mum book by Hollie Smith. 3 copies to win. Entry by blog comment. Bonus entry by Facebook share / Twitter. Uk & Ireland only….